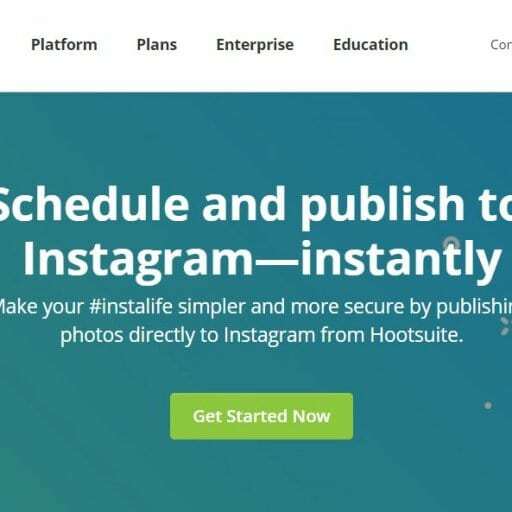 If you’re serious about growing your Instagram, then you also have to get serious with your reporting and analytical tools. The problem is that there are thousands of online tools that are charging upwards of hundreds a month. Before we start, let’s review what to look for in an industry best Instagram analytics tool. 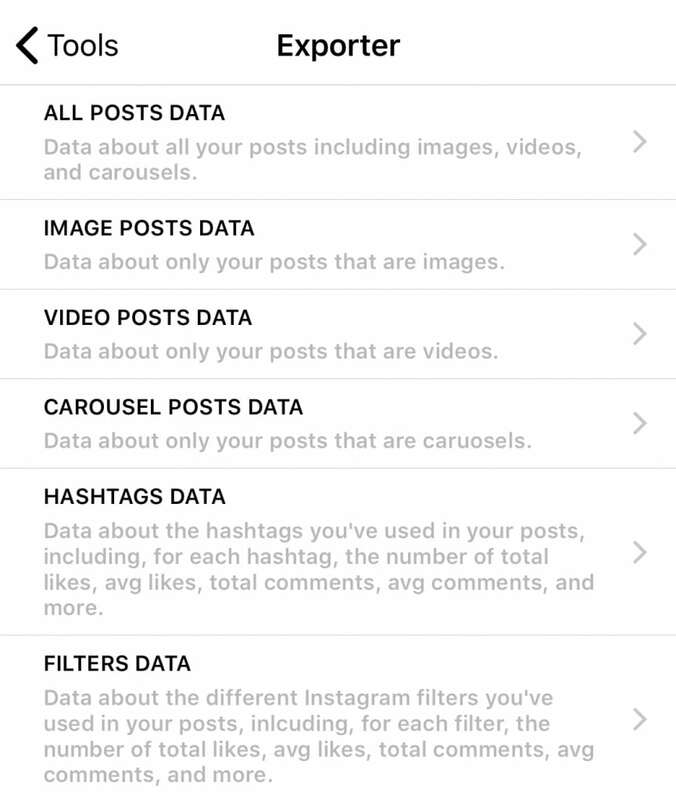 Advanced Reporting: This goes beyond what you get from the free Instagram analytics. You need continuous reporting that goes beyond a week worth of data. Included in the data, you need to track your changes in followers, engagement rates, your top posts, filters, and hashtags. Analytics: This is what most tools are missing. The ability to analyze your account and tell you where you should improve. Most analytical tools rely on the user to go through various dashboards, pull a series of data and do the analysis themselves. What you need to look for is a tool that’s able to pull the data together and provide you a summarized result. Research Tools: Continous improvement is how you will succeed in gaining a massive following. To be successful, you need the proper tools to track your competitors, tools to identify influencers you should engage and work with, and tools that help you improve your engagement for your posts (e.g. 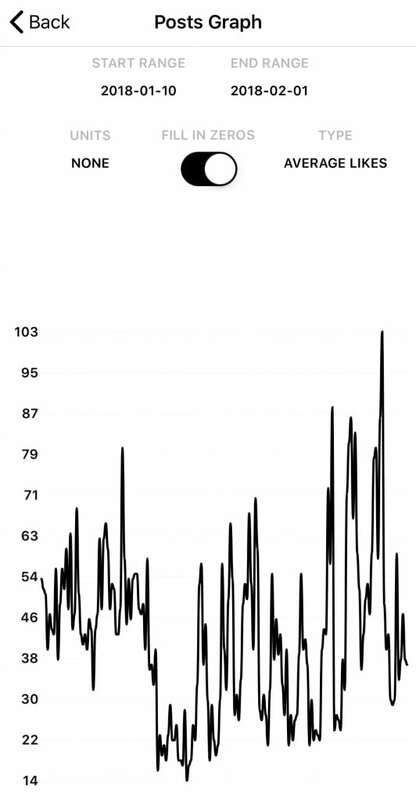 popular hashtags, best time and day to post …). That’s why we wanted to introduce the Command for IG app. It’s one of the best analytical tools out there, that is conveniently an app on your phone. 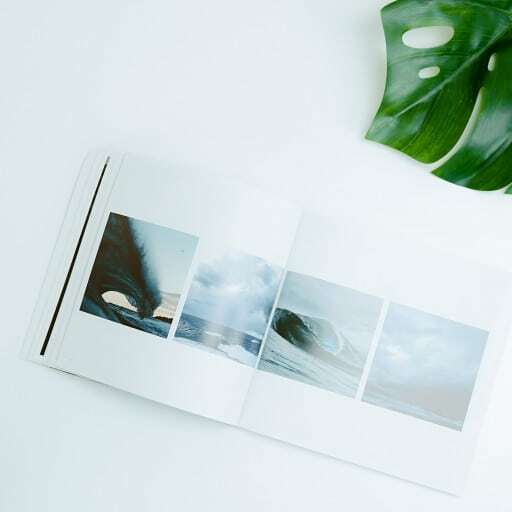 It has all the tools and reporting you need in an Instagram analytics tool, and it’s effortless to learn and understand. The only limitations we faced is it’s a hassle to extract the data in a CSV on your phone, then email it to yourself. It’s too bad they don’t have a web-based version of the app on the market today. So let’s dive right into the app and see what it has to offer. Please note that some of these tools are only available on the premium version, but the free version will have most of the capabilities you need. The first thing we noticed and love is the quick report card grade on your account. Your account gets scored on multiple factors such as follower count, engagement rate and many more. We will go more detail into this in the analytics portion of this article. 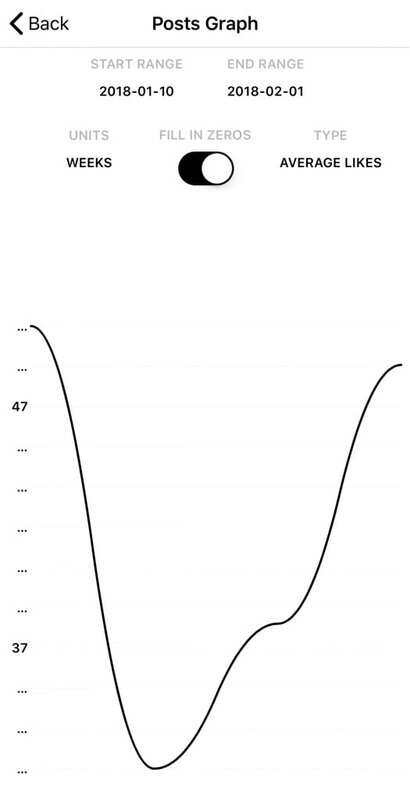 What we love the most is the post graph at the bottom of the summary. 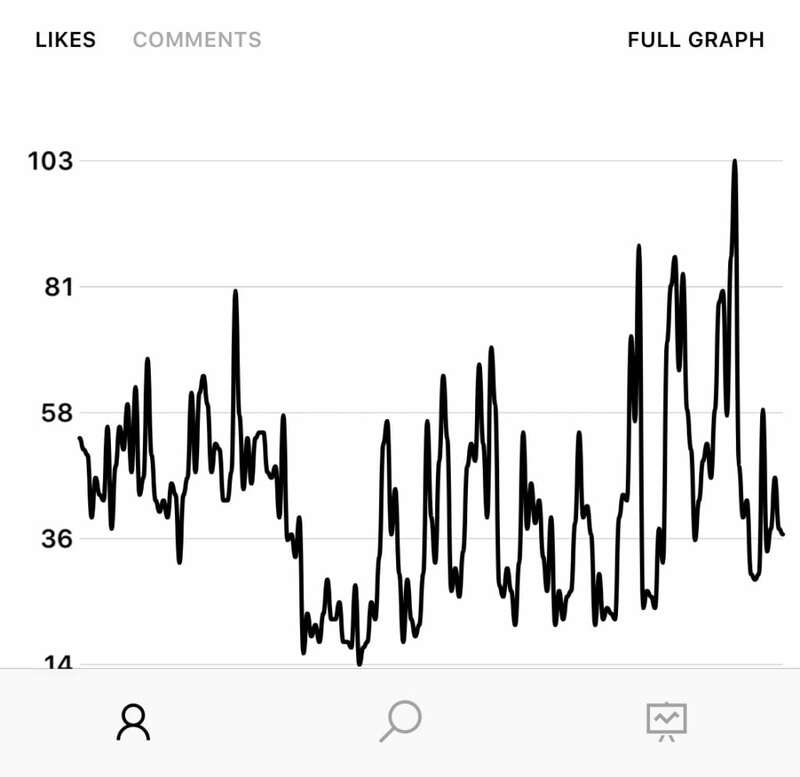 From the account summary, it only provides you the number of likes and comments you’ve received on a daily basis, but you can gain a lot of insight when you click on Full Graph on the top right of the chart. The full graph will give you powerful features such as the ability to choose a start and end range so that you can analyze any period in the past. If your data is very volatile and jumps between very high and low numbers on the daily view, you can smooth it out by weeks and months. 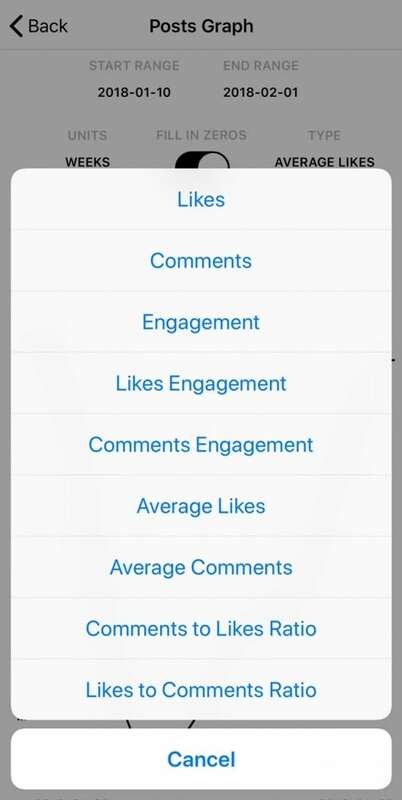 Lastly, the most powerful feature on this chart is the ability to show lots valuable metrics such as likes, comments, engagement, average likes, average comments and many more. The key metrics we recommend you focus on is engagement, average likes and average comments. As long engagement is within 2-3%, and your average like/comments is steadily increasing, you’re maintaining a healthy Instagram account. 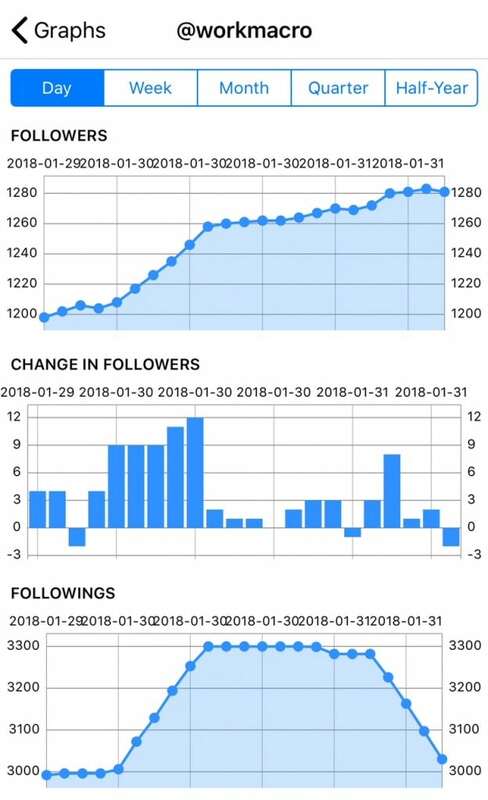 The metric we’re missing in the full graph is the ability to track your changes in followers/followings and the number of posts. We wish they included this functionality in the full graph, but unfortunately, its only available in another section of the app. Another small feature we would love is the ability to overlay different metrics together in one chart. We would like to play around with the metrics to see if there are any cause and effect that we can leverage to gain more followers. For example, we would love to conduct a test on the correlation between the number of posts and the increase in followers per day and use this tool to track its performance all in one chart. Unfortunately, the app will provide the information, but in multiple places. 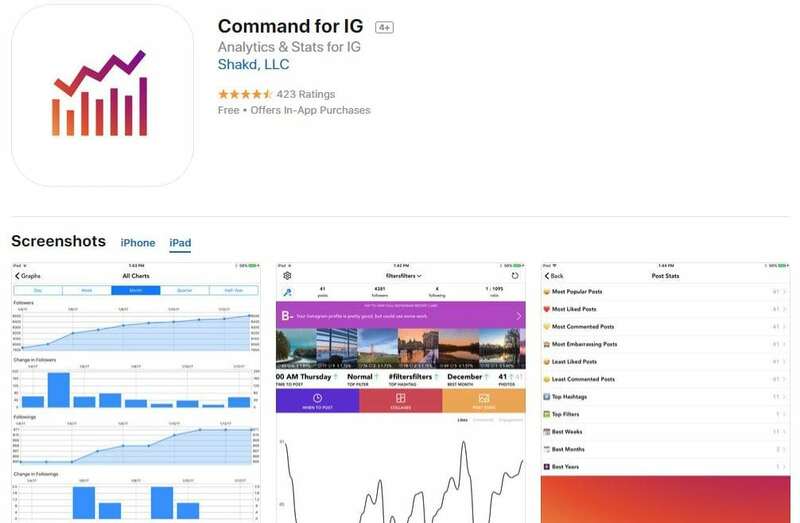 Incredibly useful tool especially for those new to Instagram analytics. It measures your account using 11 metrics, grading each one from A+ to F. You can double click on each metric to understand why you received a particular grade and steps to improve it. Here you will find all the information you need to analyze and identify opportunities in your content strategy. 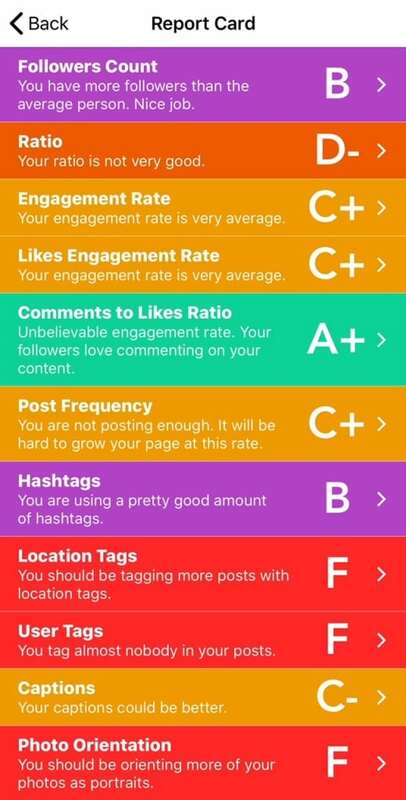 You can easily see your best and worse performing posts based on engagement rate, likes, and comments. 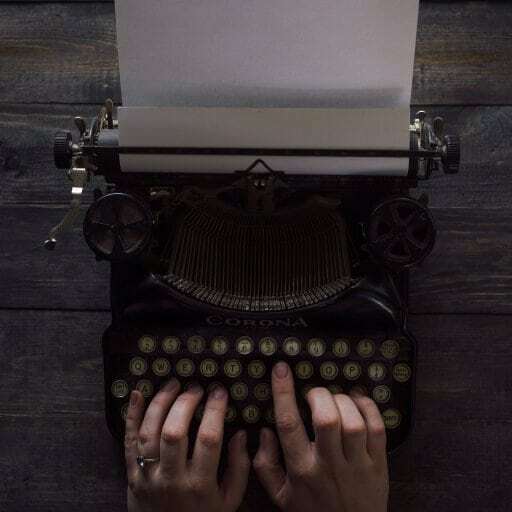 This information can be beneficial when determining what type of content is driving better results. You can also find your top performing hashtags and filters. One thing to note is that it will only analyze hashtags were included in the captions of your post. The tool does not capture data on hashtags in the comment section. Lastly, you can find your best performing posts in the week, months and years. Unfortunately, there aren’t any built-in capabilities to let you download or re-post these photos. The app can direct you to the original Instagram post link. 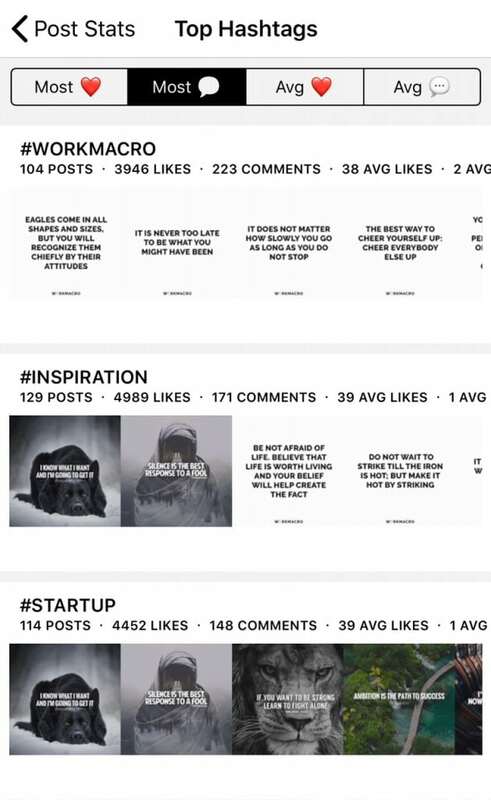 From there, you can leverage re-post apps such as Repost for Instagram. 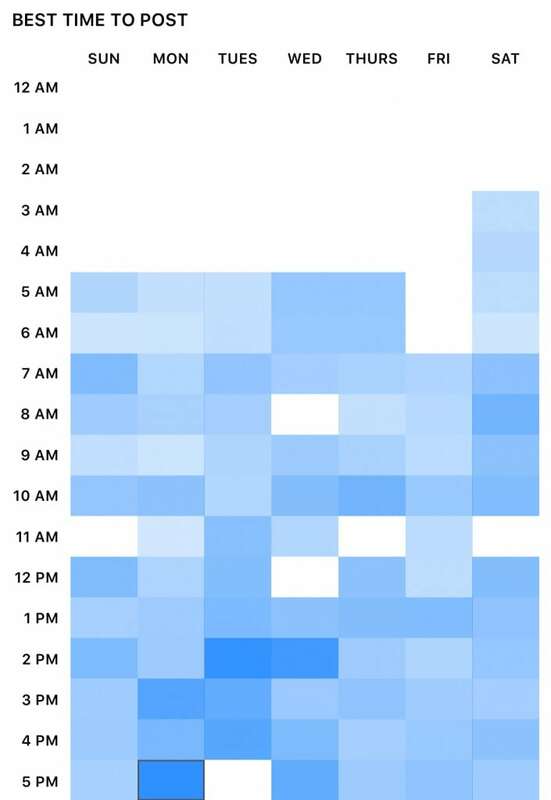 The tool provides you a heat map of the best times to post in the week. It calculates this by analyzing the engagement rates of all your posts and identifies the times you received the most engagement. We hardly use this feature since we leverage auto-scheduling capabilities from Hootsuite, but can be a handy tool if you want to find out when your users are most active. One of the most important features of this app. The exporter tool lets you download the raw data in a CSV file. Rather than going through the different sections of the app, you can build your personalized analytical dashboard. 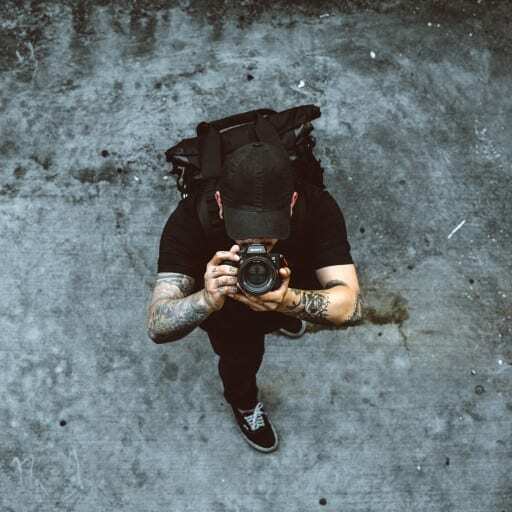 The exporter tool lets you download all your posts, with information on the number of likes and comments it’s received, the time it was posted, what filter and hashtags you used, the aspect ratio of the photo, and all the links to the original post. The app does not hide any data from you. It lets you download all the information it’s gathered from your account. We find this to be the most critical and important feature of this app. The tracking functionality allows you to monitor influencers, competitors, and most importantly yourself. 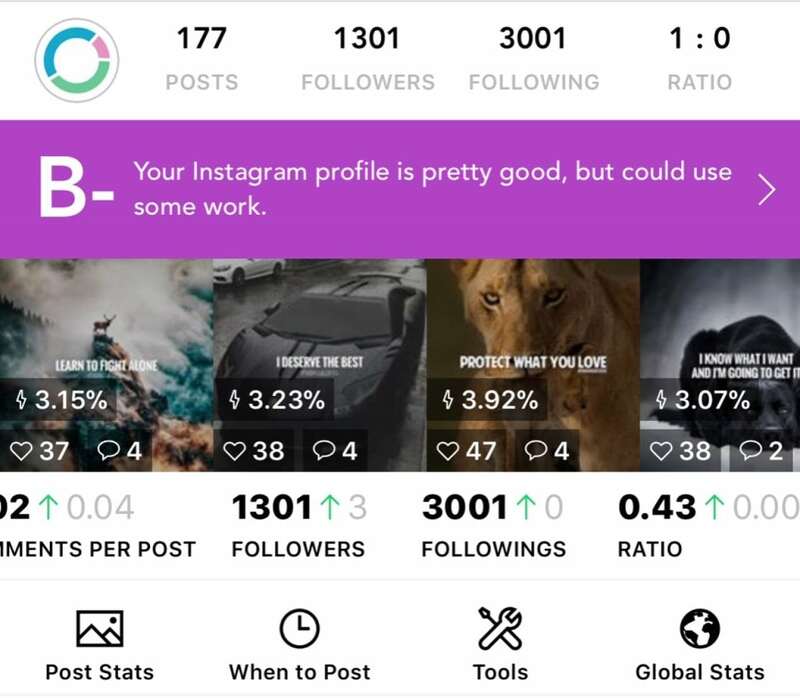 The tracking tool provides a lot more information that the standard account dashboard does not; the ability to the track the change in your followers, followings, and the changes in the number of posts. If the dates and charts are difficult to see, you also have the option to export the raw chart data in a CSV file, similar to the exporter tool. 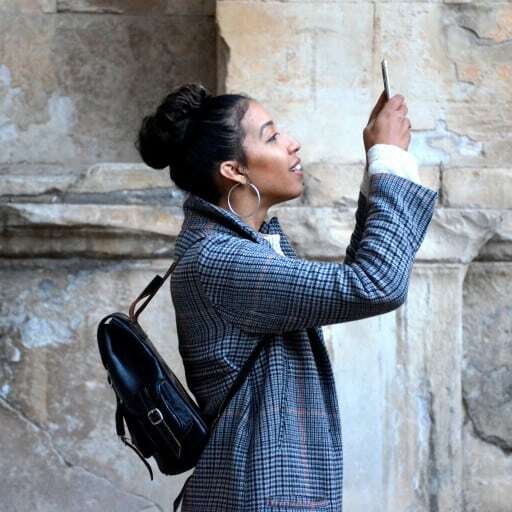 The feature lets you find influencers by a specific hashtag. 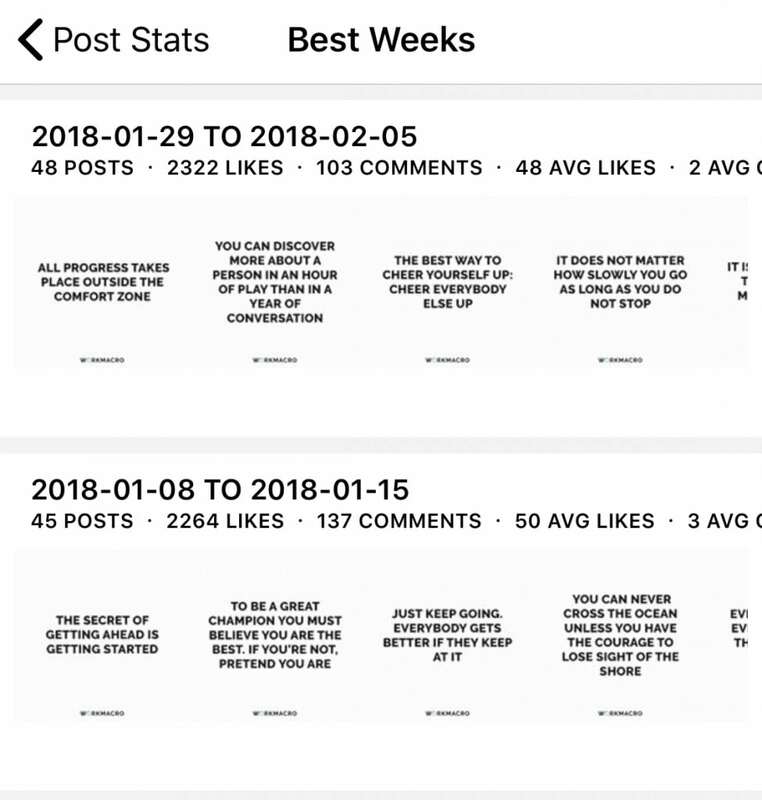 It does so by searching through thousands of recent posts that used the hashtag and identifies posts with the highest engagement (number of likes and comments). It then pulls lots of information such as the username who posted, the type of post (i.e. image, video or carousel), number likes and comments, filters used, users tagged in the photo, and the image links. All this information is available in a CSV export. Additionally, you also want to audit your list of influencers by entering their username on Social Blade. With this tool, you can review their follower growth history to see if the account has been growing organically, or have been buying fake followers. Another incredible and straightforward feature. Input a hashtag, and the tool will find similar and popular hashtags, create a list and lets you export it into a CSV. Sadly, it doesn’t provide us the number of posts in each hashtag, so it’s difficult to identify the most popular or most used hashtags. As a sanity check, we audited a list and found out most of these hashtags will have upwards of 1m+ posts. We know how annoying it is when you want a post a picture or video you took two days ago into your Instagram story but can’t because it’s past the 24 hour period. Old media story uploader lets you upload photos and videos to your Instagram story even if they were more than 24 hours old. it does so by changing the date on your photo or video so that the Instagram app recognizes it as from the last 24 hours. If you want to build content around special days such as International donut day, the international day calendar lists out all the popular international days. From quirky days such as Towel Day, and World Lizard day to more serious days such as Earth Day and Diversity Day, this calendar has you covered. The only dates the calendar is missing is the standard holidays such as Christmas, New years, and Easter. 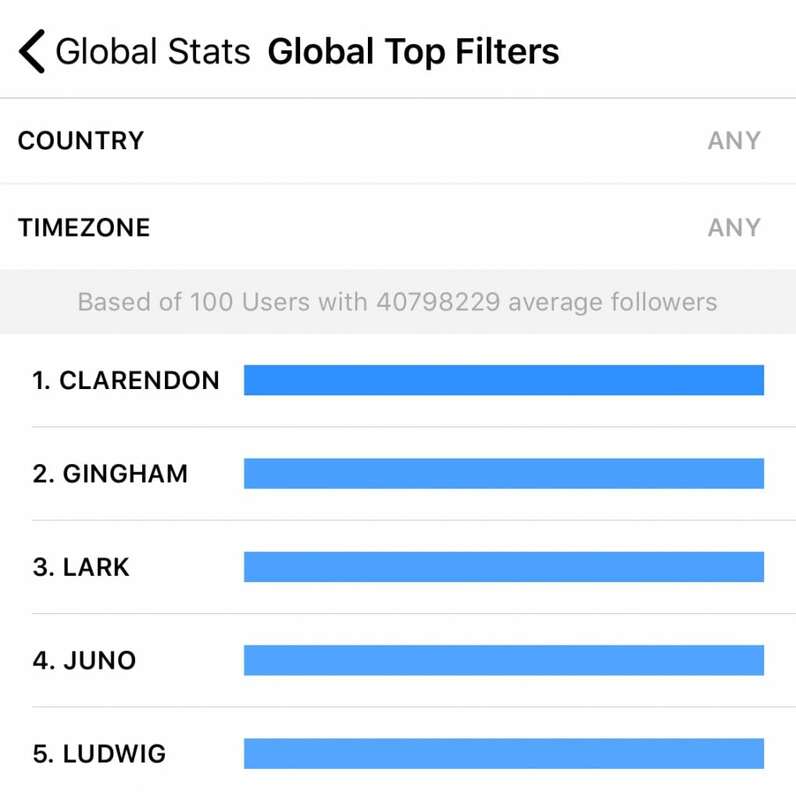 This feature allows you to explore the best times, top hashtags, and top filters across the world. You can filter it down by over 60+ countries and 110+ timezones around the world. The app is free to download but functionality is limited. The premium version costs $9.99 USD / Month. For the amount of data and analytics you get from this app, we think the price is worth it. Unfortunately, the app is only available for iPhone users. 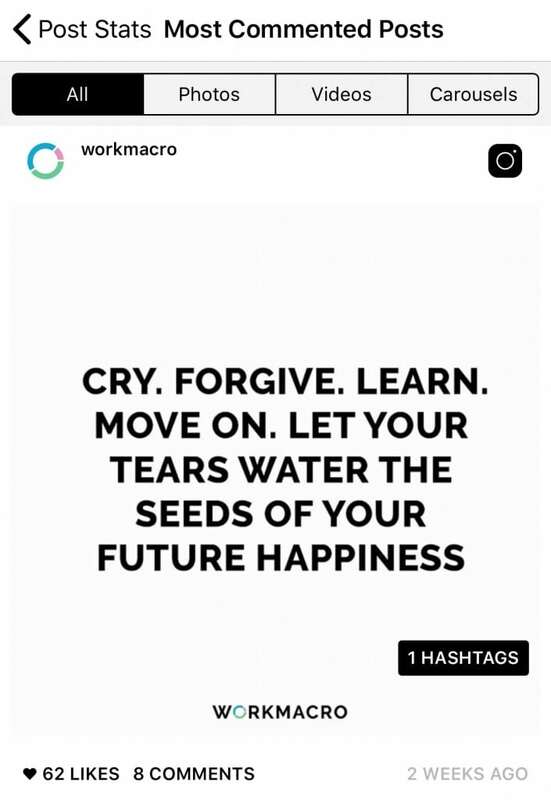 Have any suggestions for Instagram analytical tools you would recommend? Let us know down in the comments.